Memories of England’s triumphant retention of the Ashes last summer have been made all the more distant by the severe chill of the winter months. However, the first optimistic rays of sunshine are breaking through the clouds. Once you hear the distant buzz of the lawnmower, you know that the cricket season is once again upon us. This year promises another exciting season, not least with the visits to Britain of the national sides of Australia, Pakistan and Bangladesh. That same excitement can be found among those speculating upon how the domestic campaign will unfold, too. Satellite television contracts have made superstars of today’s generation of international stars, who have inspired young and old to both play and spectate. Cricket lovers with a disability are no different in terms of their passion for the game, and never has there been more opportunities for them to become involved, either as player, official or support personnel such as groundstaff or scorer. Initiatives to increase participation include professional clubs such as Surrey and Lancashire. Surrey, for example, compete at schools, club and county level. In the north-west, Lancashire are keen to ensure that from the grassroots of the game up to and including the elite level, players with a disability have every chance to fulfil their potential. And elite means just that, with both England blind and deaf squads, for example, competing at international level. Players with a disability follow many of the regulations enshrined in the Laws of Cricket laid out by the guardian of the world game, the Marylebone Cricket Club (MCC). However, due to the restrictions placed on them by their individual disabilities in terms of game play, modifications have had to be made. So, for example, blind players are categorised depending upon how severe their impairment is – from little or no sight, up to an acuity of 6-60 (they are able to see at six metres what a fully sighted person can see at 60m) with teams required to field a requisite number of players from each of the three designated categories. Similarly, deaf players must have a loss of hearing of 55 decibels or less in their better ear in order to be eligible to play, while those with a learning disability must be judged to have an IQ of 75 or less. As yet, there is no code that would allow players competing in physical disability cricket to play at international level. UK-based players compete using the profiling system for athletes with physical impairments as laid down by Disability Sports Events, a division of the umbrella body of disability sport in England. In terms of specialised equipment, blind players use high visibility stumps, and a plastic ball filled with ball bearings that must be delivered under-arm by the bowler. Deaf cricketers, on the other hand, must remove what many of them would categorise as their most prized piece of specialised equipment – their hearing aid – in order to ensure a level playing field whatever the degree of individual disability. 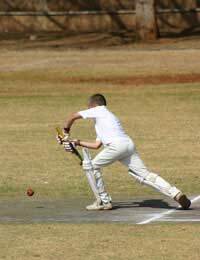 At all levels of the game this coming season, there are some very tasty duels awaiting both players and spectators of disability cricket. There may not be the intense spotlight of satellite television following every move out there in the middle, but that will not lessen the excitement and cheers that will accompany what will, hopefully, be a glorious summer that will live long in the memory.